It must be that some people just can't read. Or perhaps they don't bother paying any attention to signs. 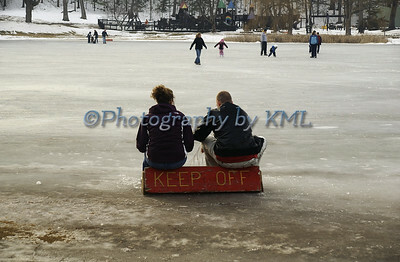 But these big, red, wooden warning signs were posted all around the perimeter of the frozen pond. But I suppose these two had a legitimate reason for being on the ice. It is pretty hard to read the sign when one is sitting on it. I thought it was too funny all the way around! There it was - just peeking through the snow. My "J" for this week - Jeep. This is the emblem on the hood front, above the grill on the vehicle. As you can see, we still have some major melting to go. Glad I took a stroll around - I was beginning to worry about what I was going to find for this letter. Weird how things come together sometimes. The calendar says it's Spring, but Mother Nature has decided she isn't through with winter yet. Some snow and ice were on the agenda for today. Hey, it covers up all that dirty snow and makes it all look pretty again. For a day or so anyway. We will appreciate the warm spring weather all the more! 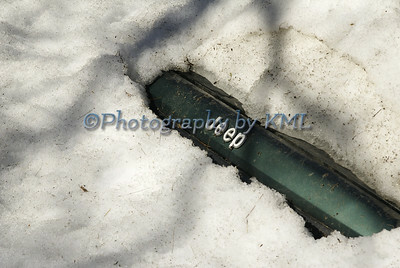 It hasn't been an overly long winter - Mother Nature was late in arriving with the snow. But when she did bring it on - she delivered big time - over and over again. 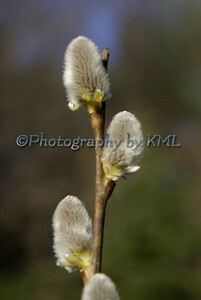 So happy we are to see this first day of Spring. And there was even a Robin in the sumac tree this morning - eating what leftovers he could find on those branches that had already been picked clean. Can't wait until the snow is gone and he can find his pickings in the grass. I thought we were done with it. After all, spring is only four days away. 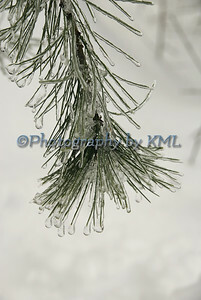 But no - we have it again - ice and wet snow. The heavy kind that makes the poor pine trees droop. 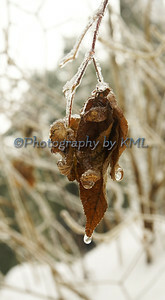 But even so, they are so beautiful with those ice drops on them. They won't last long though - temps are supposed to rise this afternoon. 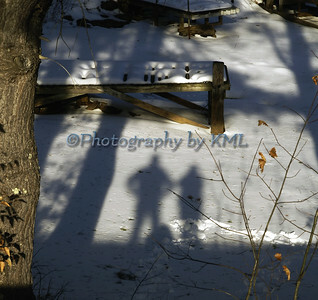 The air was cold and the sky clear - just perfect for making shadows in the snow. Standing on a small hill overlooking the docking area at the lake, the sun cash our shadows on the surface of the snow covered lake. This image was taken about a month and a half ago. We were at the lake about two weeks ago, and there was so much snow that had been plowed on top of this hill that our shadows would be no where to be found had we been able to even climb the banks. Melting has been going on this week, so it would be nice to get back down there sometime to see how it is progressing. ABC Wednesday - H is for Hair? Can you tell if it is hair? It looks like it - wispy and long. The color is right - a shade of dark brown. Tossed to the side as hair tends to do when one is laying down. It could be hair - an abstract shot of it. But is it? Look closely - are there joints on those strands? Or just a really bad case of split ends? And what is it laying on? Not a smooth pillow - it looks rather grainy. 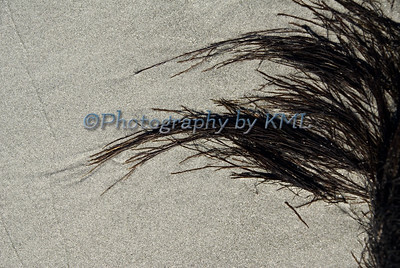 If you have chosen to guess it is seaweed rather than hair, then you would be correct. The incoming tide rolled it over and over. The outgoining tide rolled it further still, but left the long strands outstretched in the fine ocean sand - reaching towards the water as it was left behind. A beautiful abstract created by nature - graceful and fragile beside the sea. Growing up, we would visit my grandmother who lived in an apartment right next to this park. Since she had no backyard, we spent many hours here walking and playing. When I visit it now, over forty years later, I see many of the changes, but I also remember those old days. 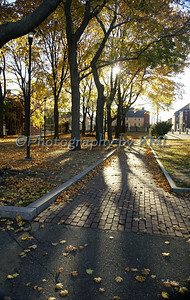 This is in the old original part of Portsmouth along the ocean front that I just love to visit. Such history, and one can really feel the "days of old" here as you stroll along. In a previous post, I showed an image of the lake on a foggy autumn morning. The next day, after a very stressful morning of medical tests, we went to the lake for a quiet lunch. And this was the view Mother Nature presented us with. 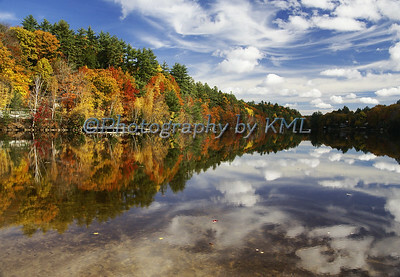 Not a ripple on the water, the sun had the trees brightly lit, and the clouds couldn't have been more impressive. We were all celebrating our good news. When nature smiles at us, all we can do is simply bask with appreciation in her beauty. When we pulled into a parking spot at the shopping center, my eye caught this right away. For some strange reason it was drawn to tire of the car next to us. 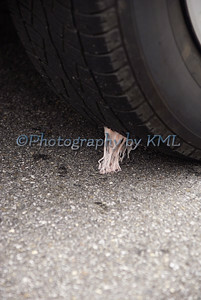 And it had this piece of gum - stretched from the tar to the tire. I am sure passers-by thought I was strange - squatted down with my camera under this car in a parking lot. I thought I was strange too - it had to be my eyes that saw it, and I couldn't just let it go. Years ago I wouldn't have done it - I cared too much about what others thought. I am not at all concerned about that now - it's the getting up and down part for these low photos that I worry about these days. But I am not going to let that stop me either.